SKOWHEGAN — It wasn’t the Augusta Civic Center court and it wasn’t the tournament, but the Skowhegan Area High School girls basketball team did it to Mt. Blue again. Trailing by 16 points midway through the third quarter, Skowhegan rallied to take a 49-47 double overtime win over the Cougars. “I’m proud of the way we didn’t hang our heads and fought back,” Skowhegan coach Heath Cowan said. 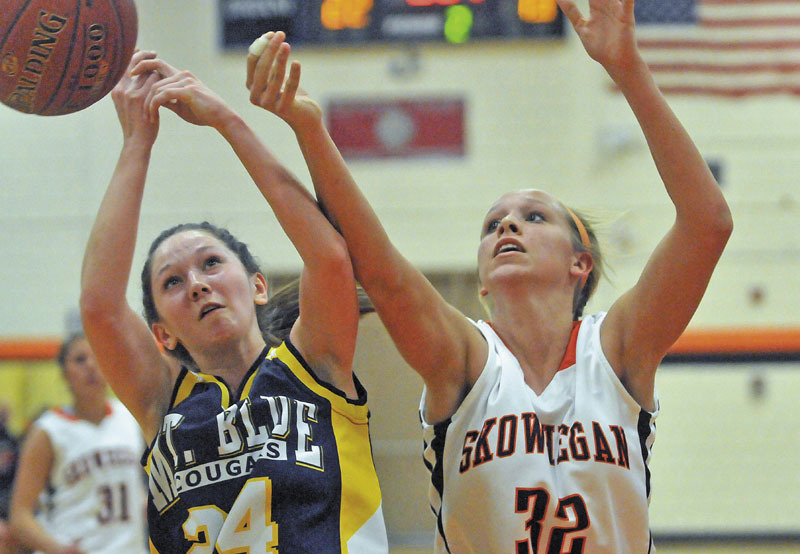 In the quarterfinals of the Eastern A tournament last February, Skowhegan trailed Mt. Blue by 16 points at the half before rallying for an overtime win. Just like that game, the winning shot Friday was made by Chelsey Whittemore. A senior co-captain, Whittemore made a jumper from the free-throw line with 1 second left in the second overtime to give the Indians (7-5) the win. What was she thinking when she let the shot go? One of the keys to the Skowhegan comeback was a better defensive effort in the second half. The Cougars (8-4) made just one field goal in the final 14 minutes of regulation, an Amy Hilton 3-pointer with 5:12 to play in the fourth quarter. Miranda Nicely, who scored 19 points for Mt. Blue over the first three quarters, was held scoreless in the fourth and overtime. “(Skowhegan) just did a real good job,” Mt. Blue coach Tom Philbrick said. Trailing 36-20 with 3:53 left in the third quarter, Skowhegan closed the period on an 11-2 run to cut Mt. Blue’s lead to 38-31. The Indians did a better job of working the ball inside in the third quarter, and 6-foot-1 forward Morgan Buker scored eight of her 12 points in the period. “In the first half, we weren’t finishing much,” Whittemore said. 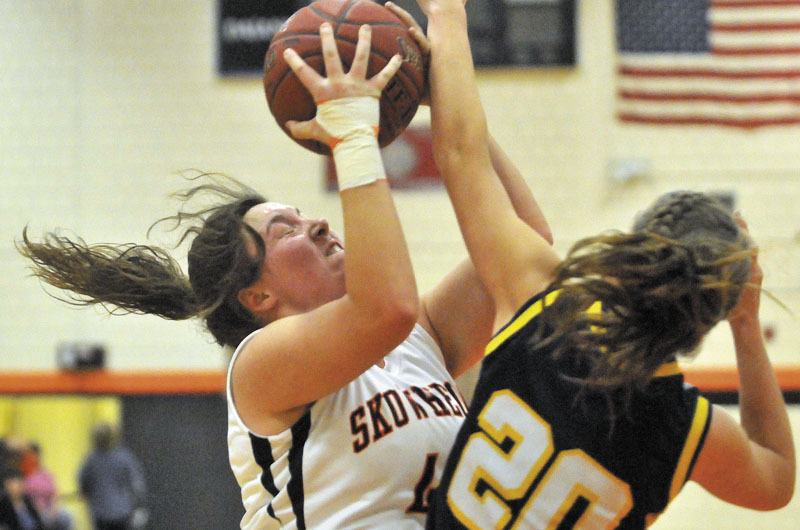 That emphasis on the inside game helped open up the perimeter for Skowhegan, and in the fourth quarter, Cheyenne Malloy made three of her five 3-pointers. “Our strength is that inside-out game,” Cowan said. A Malloy 3 cut Mt. Blue’s lead to 38-37 with 5:47 left in regulation, and Malloy (15 points) made another 3-pointer with 2:41 to tie the game at 43-43. Neither team scored again in regulation, but Mt. Blue’s Jaycee Mullen and Hilton each had a shot in the closing seconds. In the first overtime, Taylor Johnson hit her only two baskets of the game for Skowhegan, and Mullen scored four points for Mt. Blue, sending the game to a second overtime tied at 47-47. Each team was patient in the second overtime, and after trading turnovers, Skowhegan had the chance to hold for the final shot, setting up Whittemore for the game-winner. “They just executed better than we did in the second half, and got the last shot,” Philbrick said.